21st day of the year with 344 days to follow (345 in leap years). Spring begins in 58 days. 1789 The first American novel, The Power of Sympathy or the Triumph of Nature Founded in Truth, is printed in Boston, Massachusetts. 1861 Jefferson Davis resigns from the United States Senate during the American Civil War. 1908 New York City passes the Sullivan Ordinance, making it illegal for women to smoke in public, only to have the measure vetoed by the mayor. 1911 The first Monte Carlo Rally takes place. 1915 Kiwanis International is founded in Detroit, Michigan. 1954 The first nuclear-powered submarine, the USS Nautilus, is launched in Groton, Connecticut by Mamie Eisenhower, then First Lady of the United States. 1968 A B-52 bomber crashes near Thule Air Base, contaminating the area after its nuclear payload ruptures. One of the four bombs remains unaccounted for after the cleanup operation is complete. 1977 President Jimmy Carter pardons nearly all American Vietnam War draft evaders, some of whom had emigrated to Canada. 1997 Newt Gingrich becomes the first leader of the United States House of Representatives to be internally disciplined for ethical misconduct. 1999 In one of the largest drug busts in American history, the United States Coast Guard intercepts a ship with over 4,300 kilograms (9,500 lb) of cocaine on board. 2004 NASA’s MER-A (the Mars Rover Spirit) ceases communication with mission control. The problem lies in the management of its flash memory and is fixed remotely from Earth on February 6. 2017 Over 400 cities across America and 160+ countries worldwide participate in a large-scale women’s march, on Donald Trump’s first full day as President of the United States. 2018 Rocket Lab’s Electron becomes the first rocket to reach orbit using an electric pump-fed engine and deploys three CubeSats. Stunned, the man leaves. Not knowing where to turn and having $10 in his wallet, he walks past a farmers’ market and sees a stand selling 25lb crates of beautiful red tomatoes. He buys a crate, carries it to a busy corner and displays the tomatoes. In less than 2 hours he sells all the tomatoes and makes a 100% profit. Repeating the process several times more that day, he ends up with almost $100 and arrives home that night with several bags of groceries for his family. At the end of a year he owns three old trucks. His two sons have left their neighborhood gangs to help him with the tomato business, his wife is buying the tomatoes, and his daughter is taking night courses at the community college so she can keep books for him. By the end of the second year he has a dozen very nice used trucks and employs fifteen previously unemployed people, all selling tomatoes. He continues to work hard. Time passes and at the end of the fifth year he owns a fleet of nice trucks and a warehouse which his wife supervises, plus two tomato farms that the boys manage. The tomato company’s payroll has put hundreds of homeless and jobless people to work. His daughter reports that the business grossed a million dollars. Planning for the future, he decides to buy some life insurance. Consulting with an insurance adviser, he picks an insurance plan to fit his new circumstances. Then the adviser asks him for his e-mail address in order to send the final documents electronically. 1) Gerbil merry-go round, and other great microwave games. 2) Fifty new places to poke a pencil. 4) Why washing clothes causes childhood allergies. 5) Children’s guide to hitch-hiking. 6) Flying lessons for kittens. 7) Toys that your neighbors are getting. 8) Where mothers hide treats. 9) Advanced screaming, crying and whining. 10) How to avoid washing daddy’s car. ~ My “people skills” are just fine. It’s my tolerance for idiots that needs work. ~ Every day, thousands of innocent plants are killed by vegetarians. Help end the violence! Eat bacon! ~ The fact that there’s a “Highway to Hell” and only a “Stairway to Heaven” says a lot about anticipated traffic volumes. ~ So when is this “Old Enough To Know Better” supposed to kick in? ~ I prefer not to think before speaking. I like being just as surprised as everyone else by what comes out of my mouth. ~ I’m not lazy; I just *really* enjoy doing nothing. ~ I can explain it to you but I can’t understand it for you. ~ When you’re dead, you don’t know you’re dead. It’s only difficult for others. It’s the same way when you’re stupid. ~ I never argue. I just explain why I’m right. ~ Don’t confuse my personality with my attitude. My personality is who I am. My attitude depends on who you are. ~ Sometimes I sit quietly and wonder why I’m not in a mental institution. Then I take a look around and realize … Maybe I already am. I just NEED to vent…I have had enough!!! I’ll never help anyone again…EVER!!! I’m too kindhearted, or just stupid! The other day it was so cold out that I took a man into my home out of the kindness of my heart. I felt so sorry for him. Poor thing looked about froze out there in the cold. Couldn’t even talk or move. But the next morning he had just vanished. Not a word…no goodbye or even a thank you for sheltering him! The last straw was when I realized he had peed all over the living room floor! That’s the thanks I get for being good to people??? I want to warn my friends to watch out for this man! He is heavy set, wearing nothing but a hat and scarf, he has a nose that looks like a carrot, two black eyes, and his arms are so skinny they look like sticks! Don’t bring him into your house!! He will make a huge mess on the floor and then disappear! Some years ago an American tourist, ‘doing’ Europe, remarked to a fellow traveler on a bus in Stockholm, “You know, buddy, America is the most democratic country in the world. Ordinary citizens can go to the White House to see the President and discuss things with him”. Two alligators were sitting at the side of the swamp near Washington,DC. 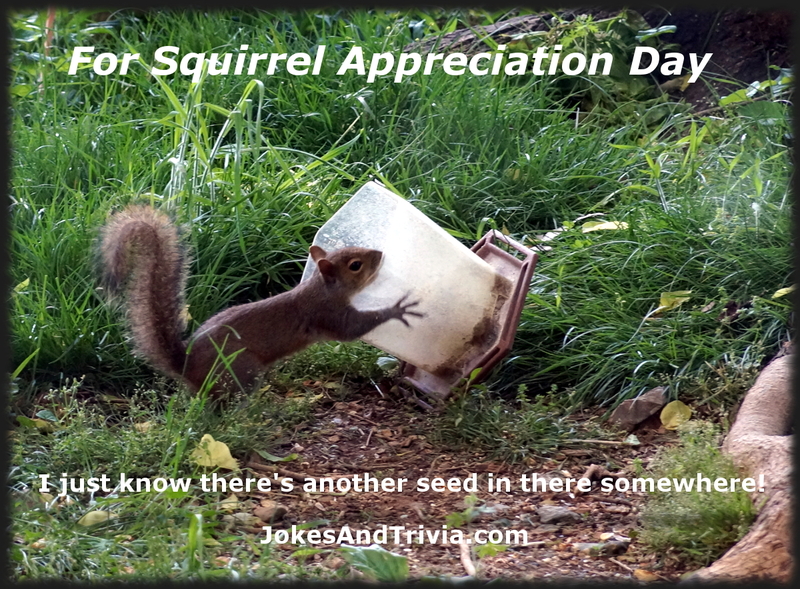 Today’s Trivia: All about Squirrels! ~ There are more than 200 squirrel species worldwide, from tree squirrels and flying squirrels to chipmunks and marmots. They’re all in the Sciuridae family, which is native to every continent except Australia and Antarctica. ~ Tree squirrels are omnivores, though they mostly eat nuts, seeds and fruit. Gray squirrels, for example, have been known to eat insects, snails, bird eggs and animal carcasses when other food is scarce. ~ Tree squirrels don’t hibernate in winter, instead relying on caches of acorns and other nuts they buried earlier in the year. Squirrels are able to smell food under a foot of snow so they can dig a tunnel under the snow and follow the scent to find their buried treasure! ~ A squirrel’s four front teeth never stop growing, at a rate of about six inches per year. This is a common characteristic of other rodents, as well. The word “rodent” actually derives from the Latin “rodere,” which means to gnaw. ~ A drey is the nest of a tree squirrel or a flying squirrel. Dreys are usually built of twigs, dry leaves, and grass, and typically assembled in the forks of a tall tree. They are sometimes referred to as “drey nests” to distinguish them from squirrel “cavity nests” (also termed “dens”). QUIP OF THE DAY: I’ve come to the conclusion that I’m a reasonably intelligent person who does moderately stupid things on a semi-regular basis.